---checked on this. It's the A-4, a 1942 aircraft bomb spotting camera. Academy versus Full Frame (S35) aperture wasn't so much time dependent as application dependent. Newsreel Eyemos were Academy so that optical sound tracks could be added; military bomb spotting Eyemos were full frame to cover the greatest film area. Missing a perf ? Could be a film loading issue. I ran into similar problems on an Eyemo 71K when I made the loops too small (having worked with Filmos I wasn't prepared for the larger film loop requirement). But I haven't run into that problem on any Eyemo shoots lately. 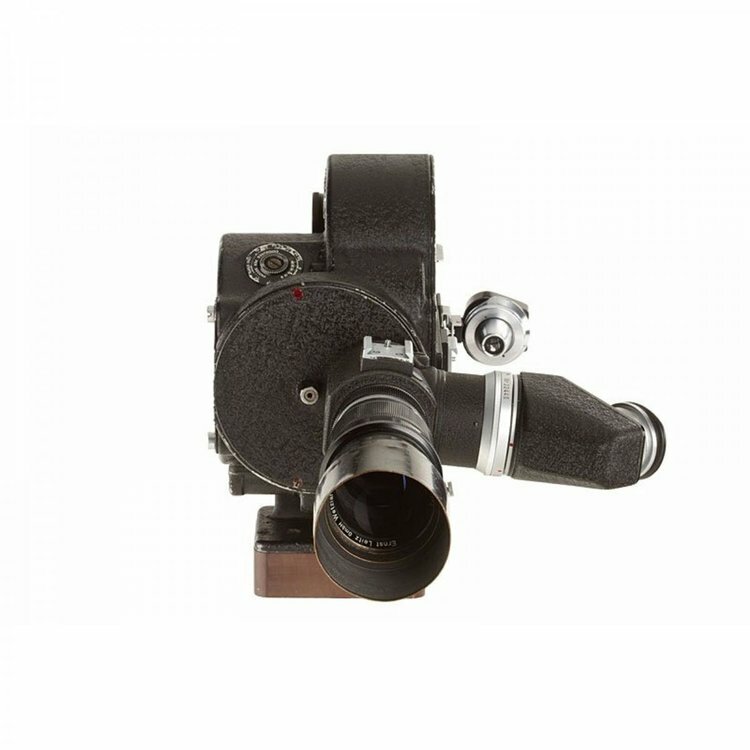 IIRC the A-4 may have been a military designation for the Eyemo 71-Z, which incorporated a folding winding handle like a Bolex. Perhaps it's like the cameras that the shop in Florida occasionally sells off - old white military cameras which are square boxy devices with electric motors and Eyemo mechanisms. I know the Eyemo is also sometimes referred to in military manuals as the PH-330-A/G/H/J (one of four different models). Miltars were indeed built for the US military and NASA. If you look at pictures of the interior of Mercury capsules you can sometimes see a Miltar lens staring out over and behind the astronaut's right shoulder. ---Bad loop might be it. Since we were setting up the footage for Xfer, 3-perf frames had to be removed. The worst I encountered was a surfing shot. At least one bad frame per foot. It might have been overcranked, thus worsening the problem. I've seen pictures of the A-4, it's not a redesignated eyemo. I saw illustrated ads in AC from an LA store sellig eyemos, 2709s and A-4s in various configurations with all sorts of accessories. The A-4 took a Cameflex type magazine and had a borefinder sight. It probably could take a sports finder. The borefinder made me think it was a recording camera, reather than a production camera. Quick check shows that aerotecdata.com sells the A-4 manual AN-10-10AA-4 4/43. But can-t take a peek. The focusing is put into an interface between camera and lens. With a Filmo or an Eyemo one can see the conical distance ring in the viewfinder (with some Eyemo models also a spirit level). One estimates or knows the object distance in order to set lens focus accordingly. Some Filmo and Eyemo models have a focusing aid built in. Through a peephole one sees the image on a ground prism surface for critical settings. It’s the system introduced in 1912 with the Standard Cinematograph Camera. There is nothing more accurate and easy to maintain by the technician than the rackover system. 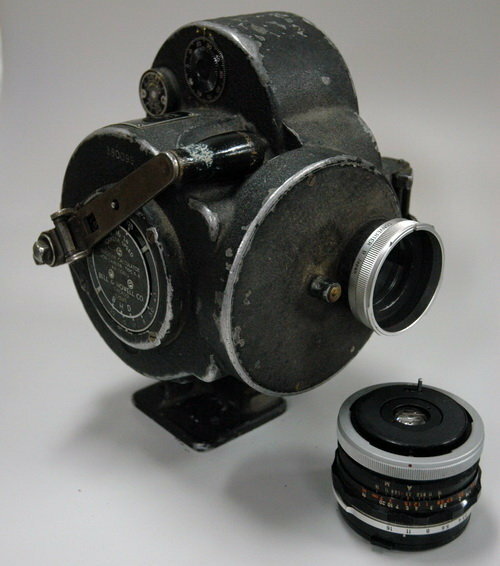 Paillard adopted it for the Bolex H cameras but only in two quite distant steps. The world has gone a long way to madness with lenses. Sure, a recent Leitz or Zeiss or Cooke grants brilliant pictures. Yet, movies only rarely answer their fineness. Action is disrupted, colours and light tumble over each other, I mean poetic they aren’t. Subtle narration, things to discover in calm but still changing scenes was last in use maybe 80 years ago, if not longer. 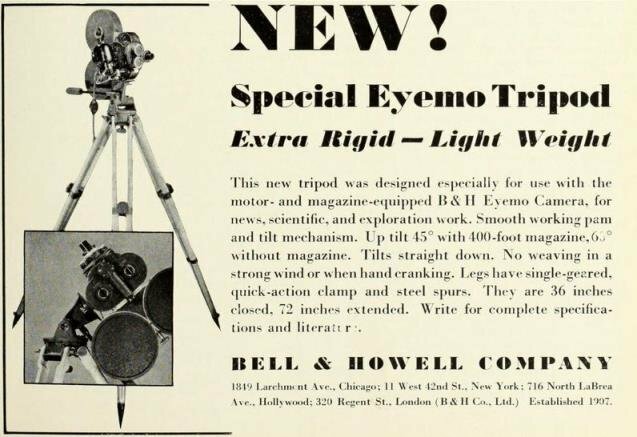 When the Eyemo camera appeared, in 1925, such an essential concept was soon lost to the talkies. So shooting with a spring driven mechanical camera and simple lenses can mean to tie in with cinema for the eyes and less for the ears. We all know The Audience is Listening which is correct in the narrow sense of the word but cinema is pictures first and sound second. Without pictures it would be radio drama. 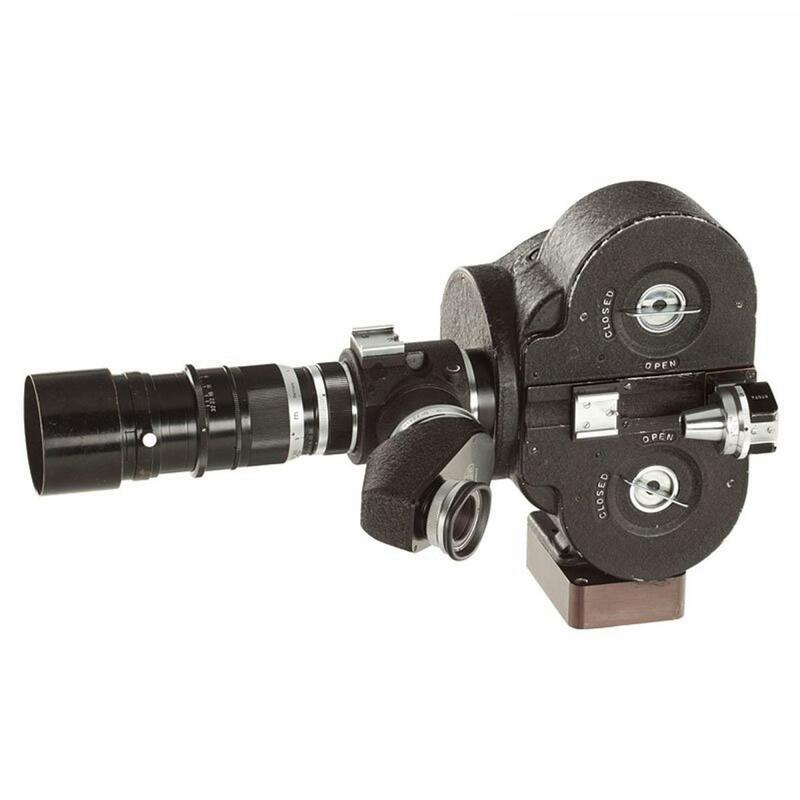 The standard mount with the Arriflex cameras is a metric copy of the Bell & Howell spigot mount. 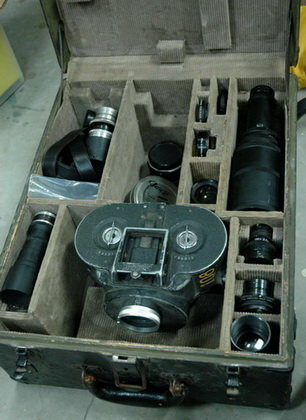 ARRI brought their first mirror shutter camera with a copy of the Bell & Howell compression lock. So many ideas came from Chicago but not with optics. In that field the company depended on others. I’m sure the 50 mm (2 in.) triplet is a Cooke. Bell & Howell Lumax, Acura, Eymax, Extol, Anate, Telate are made by Wollensak. The Bell & Howell Co. purchased lenses from Wollensak, Taylor, Taylor & Hobson, Angénieux, Berthiot (Hyper-Cinor), the General Scientific Corp., Chicago (Miltar), and in Japan. Anate derives from Anastigmat Triplet Economy. Telate from Telephoto Anastigmat Economy. Wollensak lenses whose name begins with a V are four-element designs, either Petzval or Tessar types. Raptar stands for Rapid Tessar. Bell & Howell Co. made a line of projection lenses in house but the company when founded was based on extensive outsourcing. Only few parts of their perforators, cameras, printers, and splicers were actually made in Skokie. From 1930 through 1932 Bell & Howell bought themselves into the majority of the TTH stakes, a more or less friendly take over. Not all TTH lenses for small-gauge film cameras are of the finest quality. Mechanics sometimes leave a little to be desired. Pressure from Chicago. Wollensak had to adapt some simplicity, too. 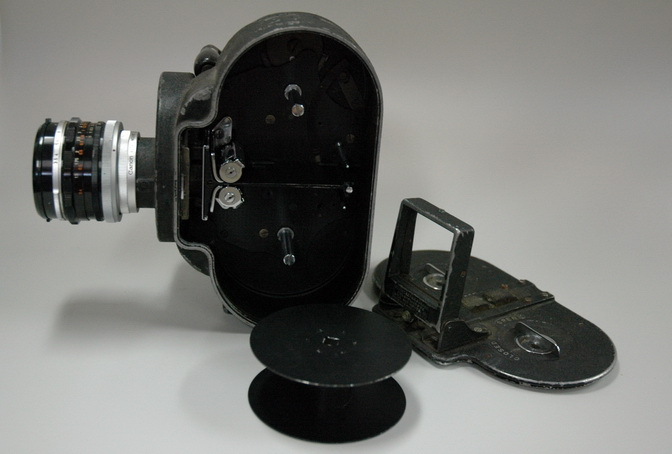 Some lenses have crimp-closed mounts, impossible to open without loss of original state of parts. Extol are Hugo Meyer, Görlitz. Not all Wollensak V initial lenses have four elements, the Verito has three elements. Bell & Howell never made any lenses themselves. sold on B. & H. apparatus until about 1961. Carl Meyer is a mesh-up of Carl (Zeiss) and (Hugo) Meyer, nothing but a brand name for Burke & James lenses. Maybe I missed this elsewhere but what would it take to get a Leica Visoflex to work properly, with the correct focal depth (I hope my terminology is correct here) mounted to the front of an Eyemo? - Is it even possible? I had an Eyemo modified years ago to take Canon lenses (I believe that a short section of the Eyemo barrel had to be removed to get the depth correct). 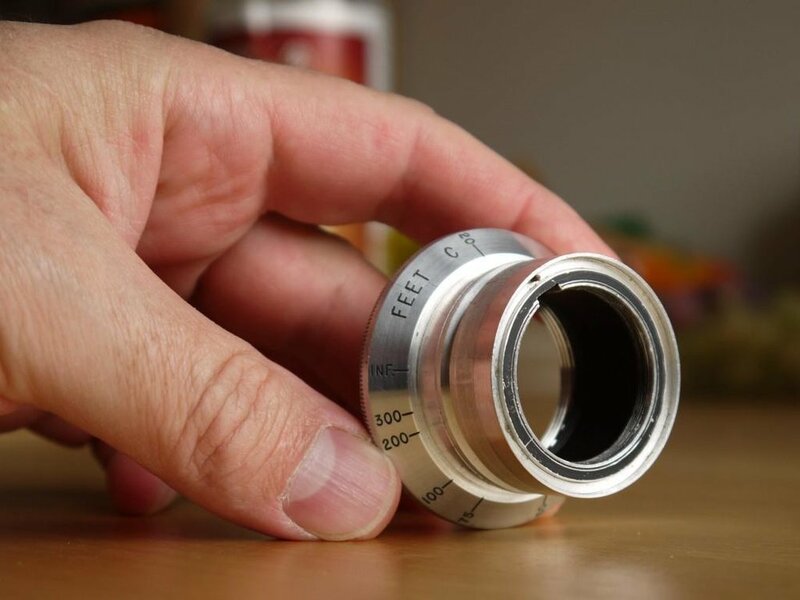 Leica M flange depth is about 10mm shorter than Eyemo, so you'd probably need to replace the turret with a custom hard front. Canon flange depths are longer than Eyemo, so conversion is easier, but the mount diameter becomes an issue, hence material being removed. Thanks for the info Dom. BTW, I really like the postings on your Cinetinker site where you dissect the Eyemo, Arri IIB, and Bolex. 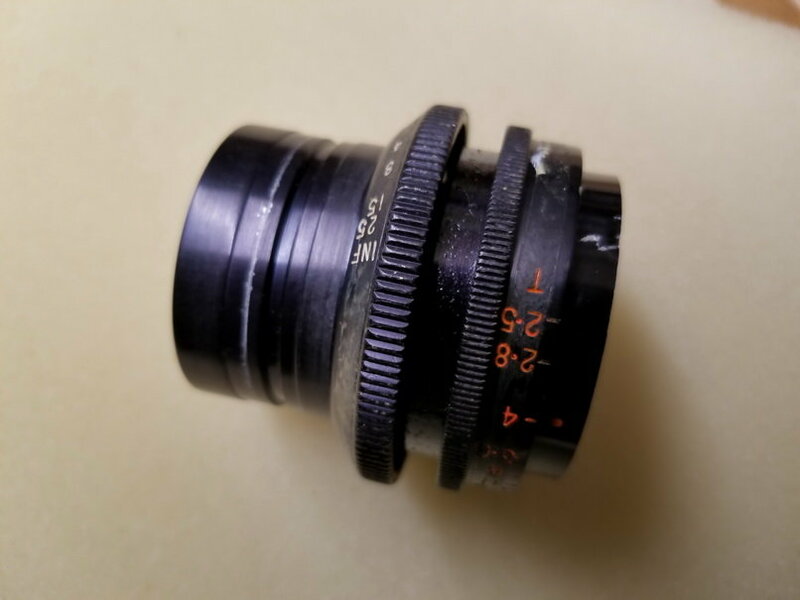 If the flange depth is shorter for Leica, could I make a custom adapter for the Visoflex > Eyemo (probably by taking apart an old Eyemo lens)? I would be extending the distance a little, correct? From what I understand of the Visoflex, it mounts to the camera via Leica M mount and gives you reflex viewing through the attached Leica lens. So you'd need to modify the Eyemo mount to accept a Leica M lens mount, which means having the new mount seat around 10mm inside the old Eyemo mount. That's why I think you'd need a whole new front, an adapter won't work. I realize that I misunderstood which one was shorter and which was longer, thanks for your follow-up Dom. Long ago I sold the Eyemo that I had modified with the Canon mount, but I'll track down some photos of it and post here. Here's the old Eyemo that I sold to a WW2 collector. Somehow I came across this little Canon mount which required very little modification of the camera to fit it on. A very old cameraman in Portland, Oregon by the name of Bill Crispin did the work. "almost similar 35mm camera to the previous lot, converted for Leica M39 screw mount with unique by Leitz built 18x24mm Visoflex I (no.22446) with semi-reflecting mirror for simultaneously scoping and filming and Telyt 4.5/20cm no.1503010 (hood), VIOOH universal finder no.87574 (with strap, used as directors viewfinder), metal case." I think someone mentioned this lens recently in the forum? 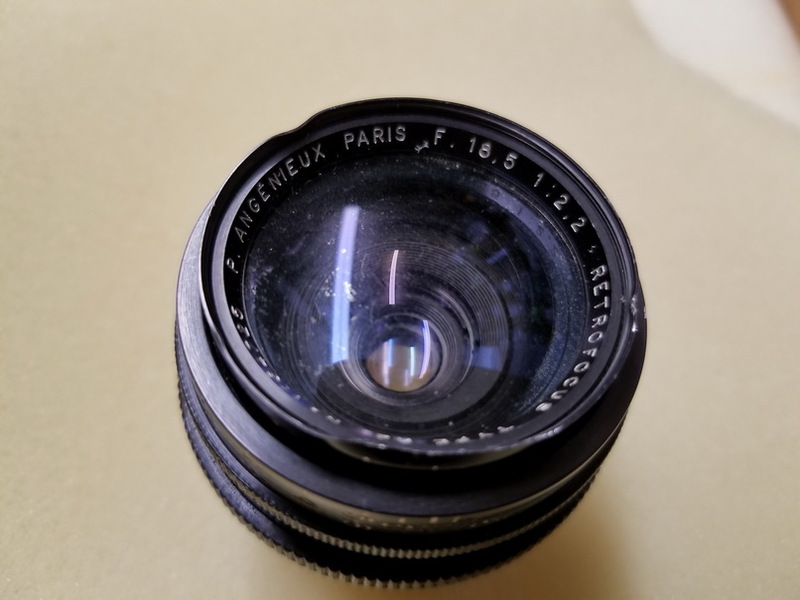 I dug it up over the weekend - years ago I got this Angenieux 18.5 lens in an Eyemo mount. Beat-up and dirty, but still a beautiful lens. I have barely ever used it since I only shot with my Eyemo a few times. I don't think there are adapters to fit the Eyemo mount to Micro 4/3rds? Many scenes in Orson Welles' movies of the 50s were shot with an Angenieux 18.5mm, including the iconic "Touch of Evil". Cooke's 18mm Speed Panchro soon eclipsed it, but in the early 50s this was the widest lens available for 35mm cinema. I haven't measured it, but it's possible the rear protrusion of an Eyemo lens mount doesn't fit through the opening of a mft mount. By the way, has anybody ever had or used the Eyemo tripod? I pride myself on not being afraid to ask dumb questions of smart people. 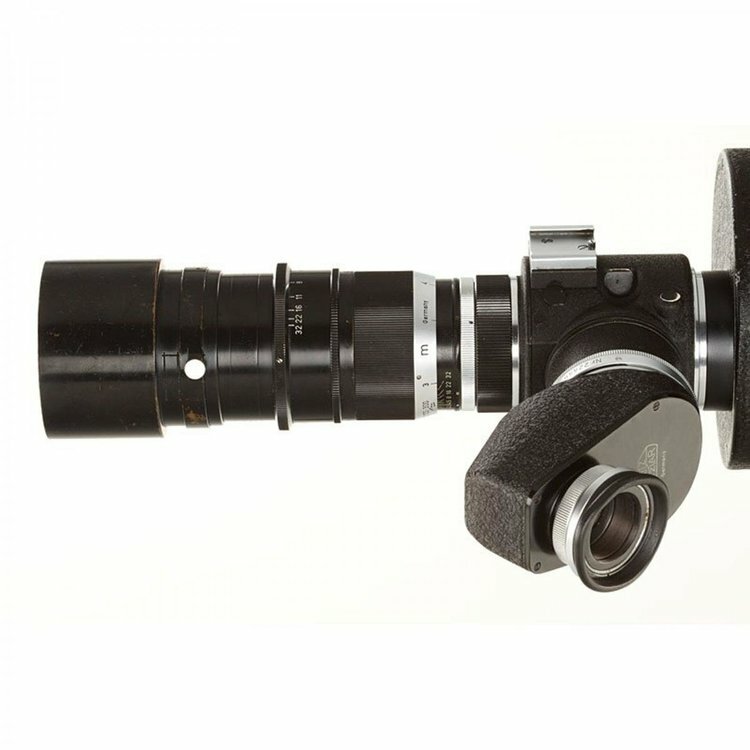 In this spirit, I sent an email to Les Bosher to inquire about an adapter that would fit the Eyemo lens into an Arri standard mount (an Arri 2B with the spring-loaded levers on the lens sockets) - or if it's possible. He confirmed that it is NOT possible. So I would assume it's also not possible for an adapter to fit it to a Micro 4/3rds mount. Adapting is almost always possible; it's the focusing that will be an issue. Or I guess you could say adapting it properly for infinity focus to be accurate is not always possible. Hey Everyone, Any recommendations on where to get an Eyemo modded to have a PL mount? or maybe an adaptor?